Happy Memorial Day weekend! I did my annual Memorial Day phenology photo shoot today, to track progress of where things are this year, compared to last year and years past. Click the peony to see the whole set. Short version: every perennial plant is at least 1 week ahead of schedule, 2 weeks ahead of last year (we had a late spring in 2011). Enjoy your long weekend, everyone! Categories: Gardening, Practical | Tags: edible landscaping, native plants | Permalink. 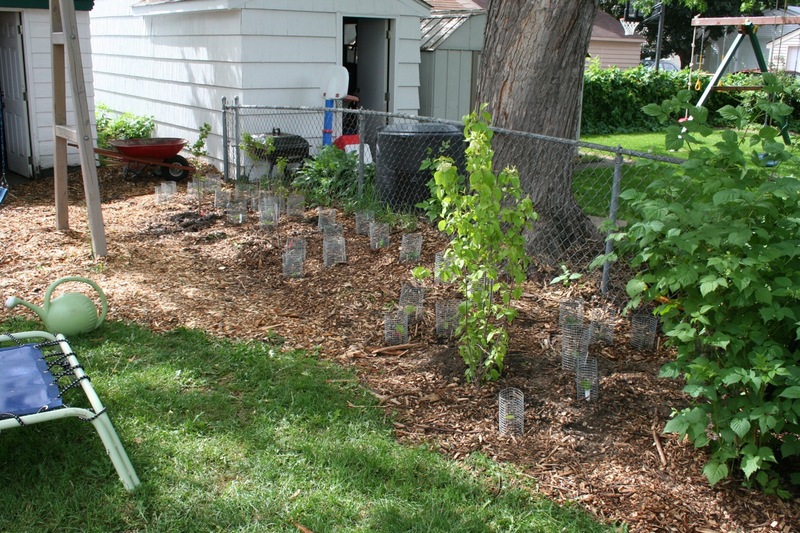 After what seemed like months of prep work, we’re finally planting our native back yard landscaping project! We’re about 60% done at this point. We haven’t been able to find everything on our list, but we found suitable replacements. I can’t believe how many are edible in some respect, even if just as herbal tea. More on that later. I had a moment of panic last Sunday when I realized that rabbits most likely enjoy eating nearly all of the plants we’re adding. Once they’re established, they will be able to withstand a bit of nibbling. But right now, they could all be wiped out. 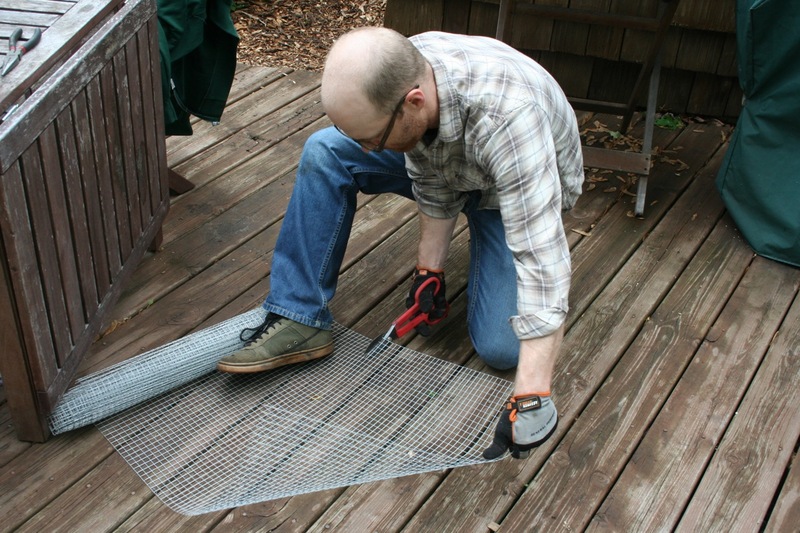 Cutting with a wire snips. Each piece was then cut into three 8-inch high pieces and rolled into little baskets. Yep, that is how small our plants are at this point. We went for cheap small plants, knowing how fast natives tend to grow and fill in. 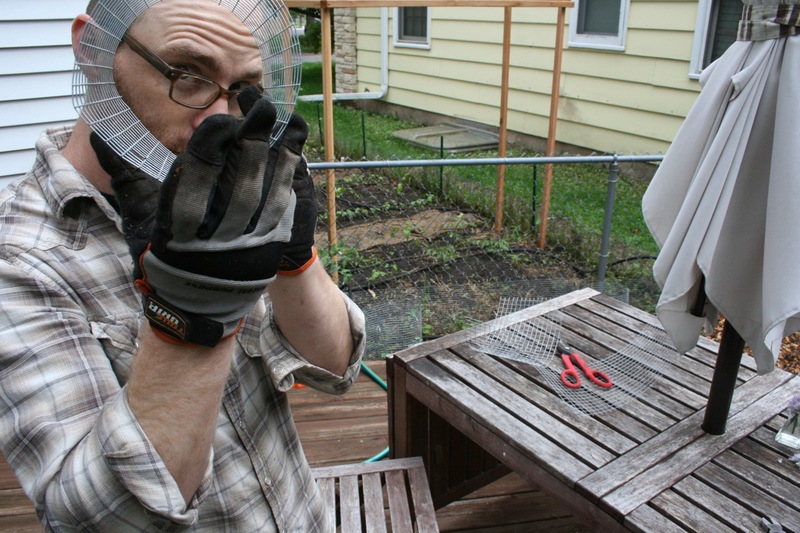 It’s a good idea to wear gloves when doing this sort of work. Looks silly, doesn’t it? But it also has the added benefit of keeping these plants safe from being stepped on by the two kiddos running around the yard constantly. My kids are careful about not stepping on plants, but these are honestly hard to see; they’re so tiny. I plan to leave the baskets in place until the plants start to outgrow them — might take all summer, but it’s worth it. Next year they should be OK without protection. Especially if Adam makes good on his rabbit stew threats. 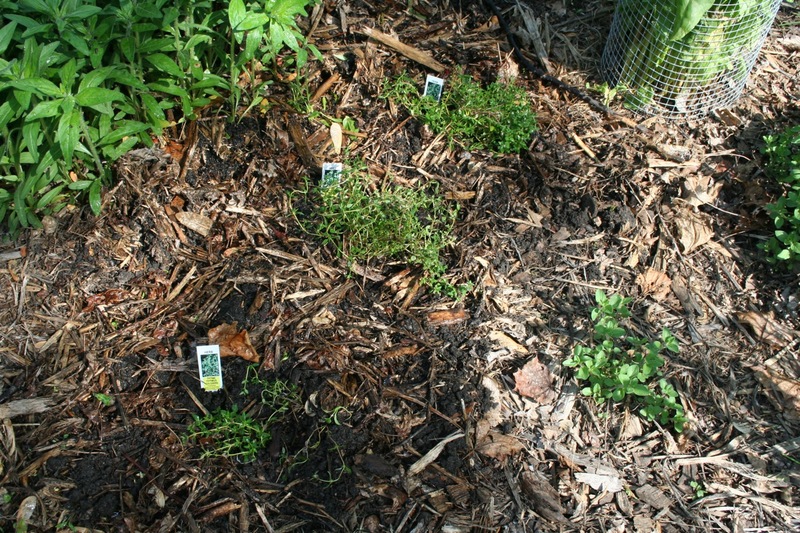 If you’re not growing thyme, well, you’re really missing out. It’s a perennial even here in the northland. It tastes great in nearly everything, and is featured in many different regional cuisines. It has health benefits. There was even a restaurant in southwest Minneapolis for a few years called “Never Enough Thyme” — and it’s true. Oregano to the lower right, sorrel in protective cage to the upper right, super invasive lemon drops to the left — I cannot eradicate those things! This is a part-sun location fairly close to our large elm tree in front of our house. I like growing lettuce and herbs in part-sun situations because they take longer to flower than in full sun. 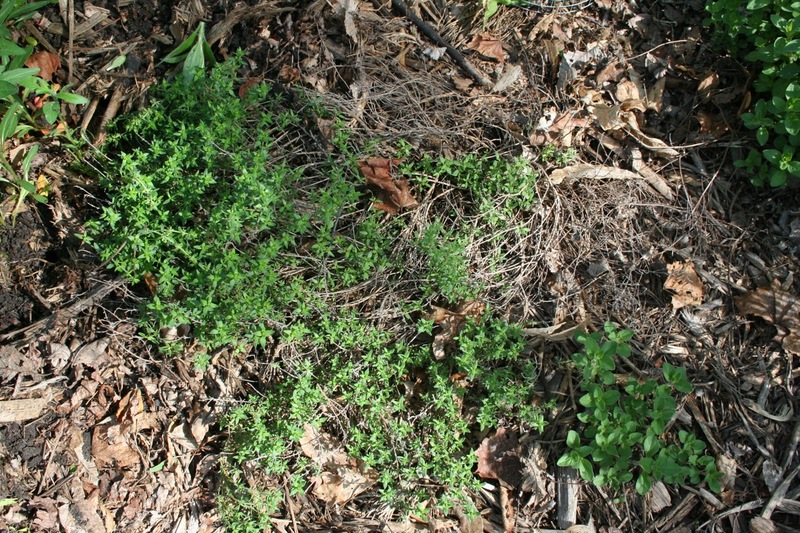 There’s our thyme supply until about 2015 or 2016! Categories: Cooking and baking, Gardening, Nutrition, Practical | Tags: edible landscaping | Permalink. I’ve been exploring leftover oatmeal recipes. 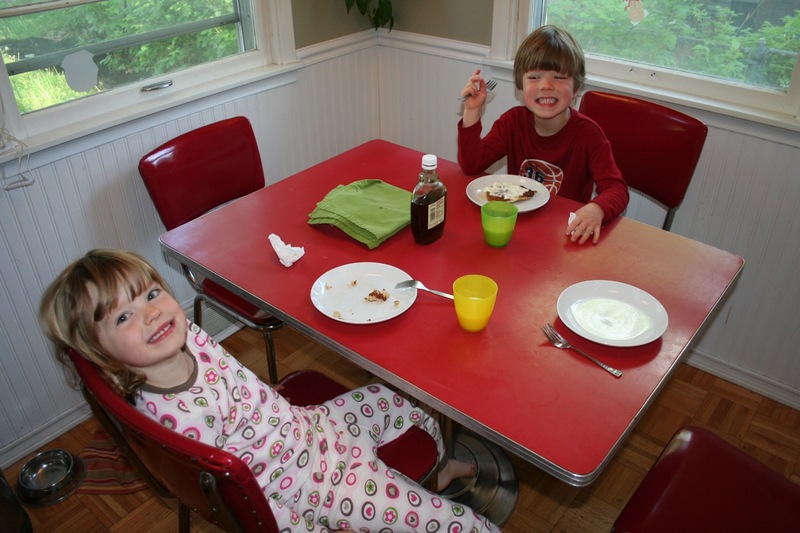 Leftover oatmeal muffins were not a big hit, so last week I tried pancakes. I wanted a recipe that was more like oatmeal than pancakes, so I searched for one that called for more oatmeal than flour. This one worked out great. Here’s the original recipe; my version is below. 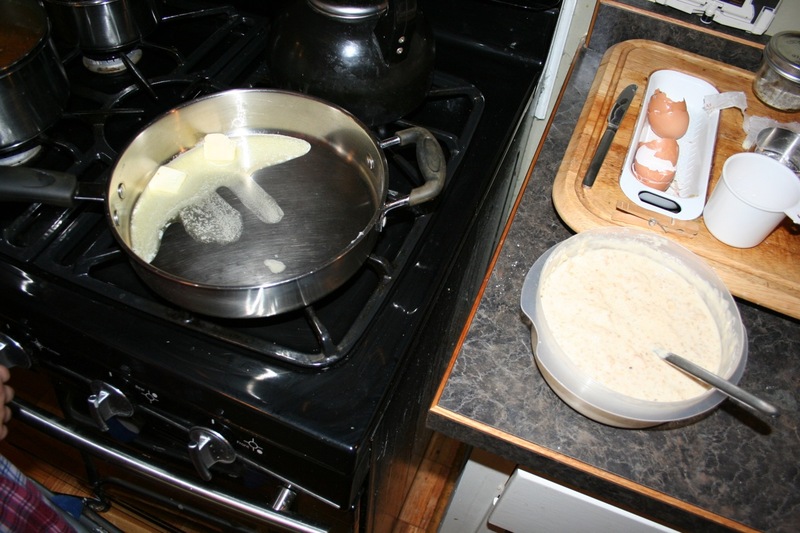 Place the butter in a frying pan over low-med heat. 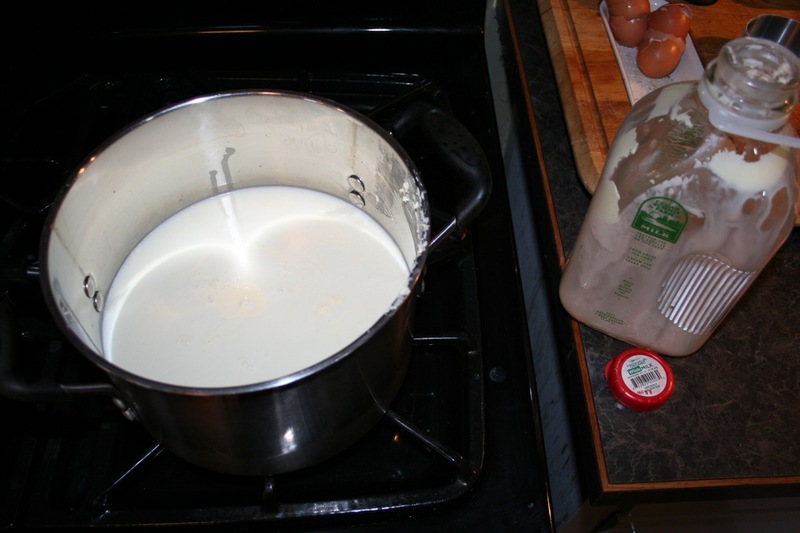 Meanwhile, incorporate milk into leftover oatmeal until the lumps are mostly worked out. Add eggs, flour, and baking powder and stir, adding a bit more flour or milk until desired consistency. When the butter’s all melted, pour it into the batter. Stir quickly while you pour, so you don’t cook the eggs. Now your pan is hot and buttered and your batter is ready. Pour the pancakes in. These were a bit more delicate than standard pancakes — they did best when I let them cook at least 3-4 minutes per side over lower heat. Don’t they look marvelous? I loved these. If the leftover oatmeal that you use was sweetened, they need very little topping. If it was plain, a bit of fruit or maple syrup would be lovely. 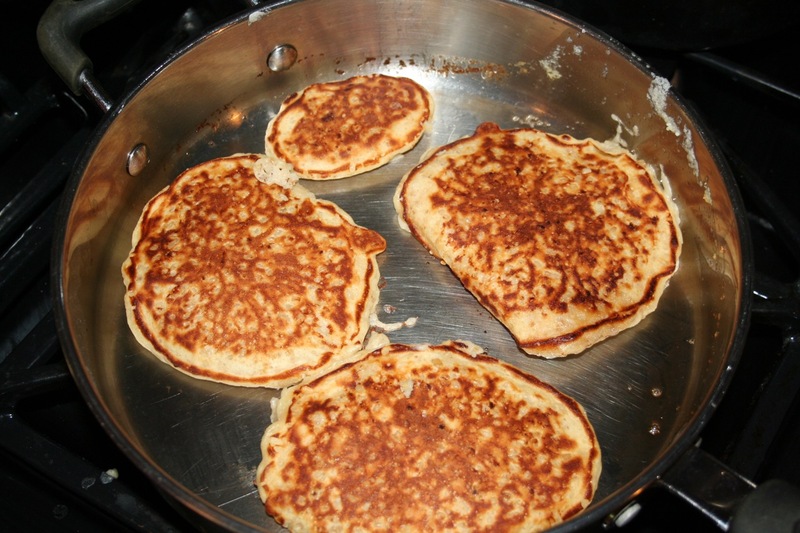 They look like a pancake, but the inside is creamy rather than cakey. I loved them. Rowan loved them. Anneke said they were just OK, but she ate all of hers anyway. People with texture issues might not be into a creamy-centered pancake. But if this sounds good to you you’ll probably like it. If not, there are a lot of recipes out there that produce a more cakey result — think less oatmeal and more flour. This made quite a few; we had them for breakfast and then I froze another entire breakfast’s worth and ate them a few days later. 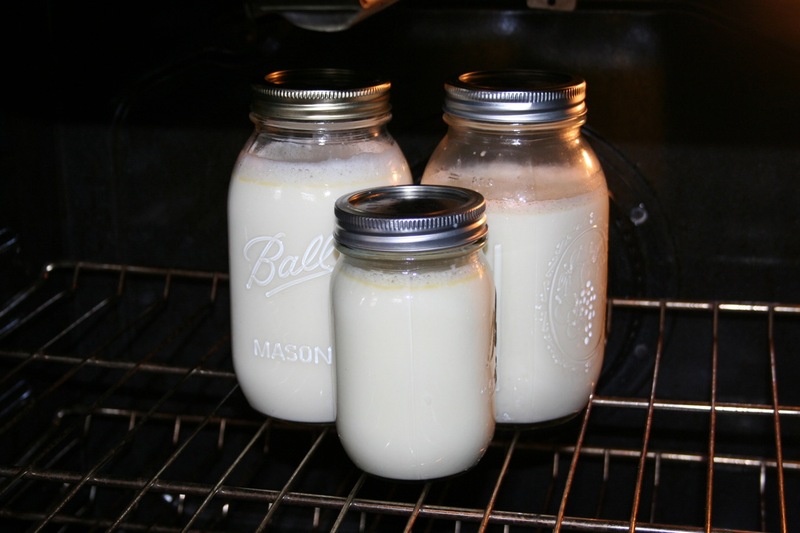 Start with a 1/2 gallon of the best whole milk you can get your hands on. 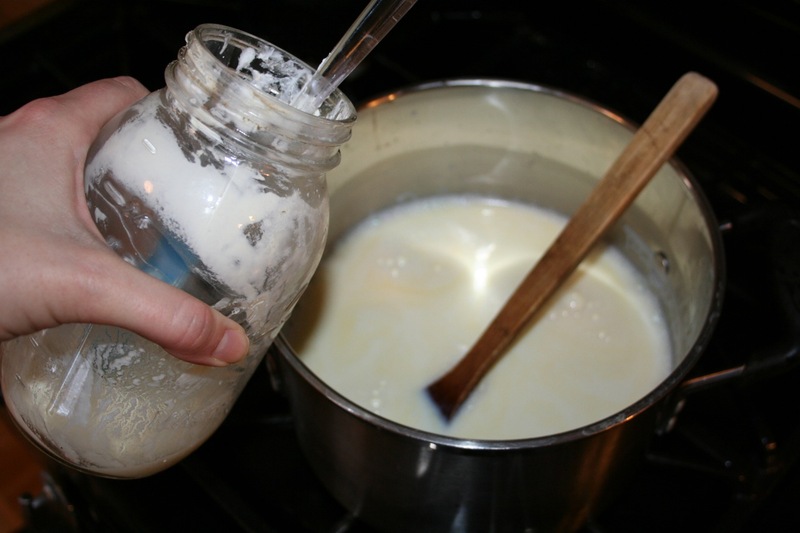 Heat it to just around the boiling point, or 180 degrees F. Remove from heat, plunge into a sink full of cold water, and bring the temperature back down to 110-115 degrees F.
Stir in a cup or so of yogurt from your last batch. Whisk. My oven has a setting called “proofing” — for people who have time to bake bread (some day I’ll get back into it, sniff) — it holds the oven at around 100-110 degrees. Perfect. 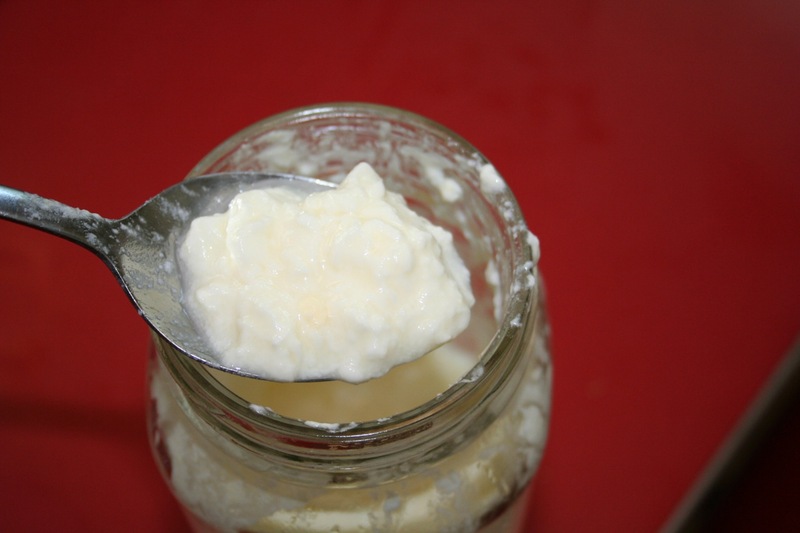 I bake my yogurt overnight usually, around 8-9 hours. Simple, and it makes quite a bit — usually around 80 ounces. Still no plastic to recycle (though now the city of Minneapolis does take yogurt containers). A little chunky for ya? That’s what happens when you use non-homogenized milk. Doesn’t bother me, honestly. A solid week’s worth of full fat yogurt from grass-fed cows who live less than an hour away (and who I’ve actually met) for only about $5. Cool! Categories: Animal ethics, Cooking and baking, Nutrition, Practical, Theoretical, US Food Production | Tags: DIY, gettin' groceries, yogurt | Permalink. In late March/early April Adam busted out the entire sidewalk with a sledgehammer. 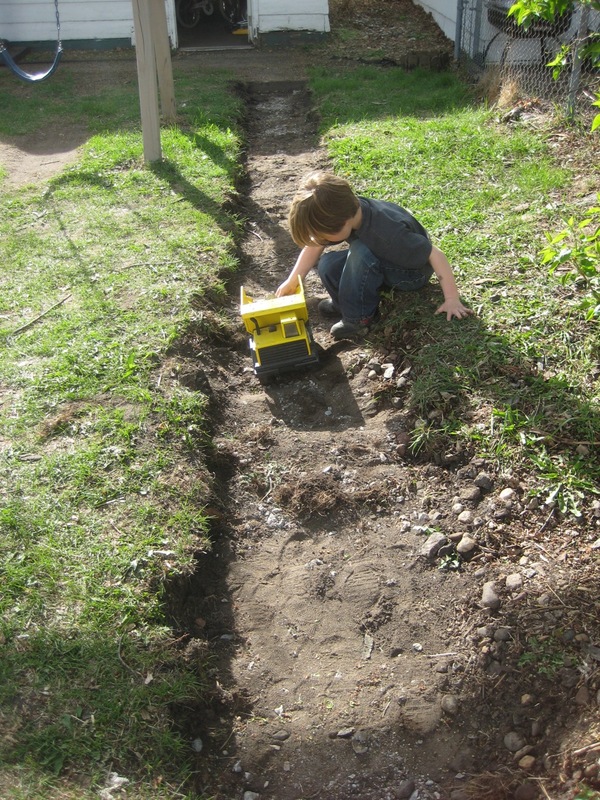 Though Adam hauled away all the big pieces, the kids got busy hauling smaller pieces with their dump trucks. Adam piled the concrete in the back alley. With faint hopes of avoiding dumpster fees, we posted an ad on Craigslist — free concrete to any taker. Low and behold, the entire pile was gone a week! 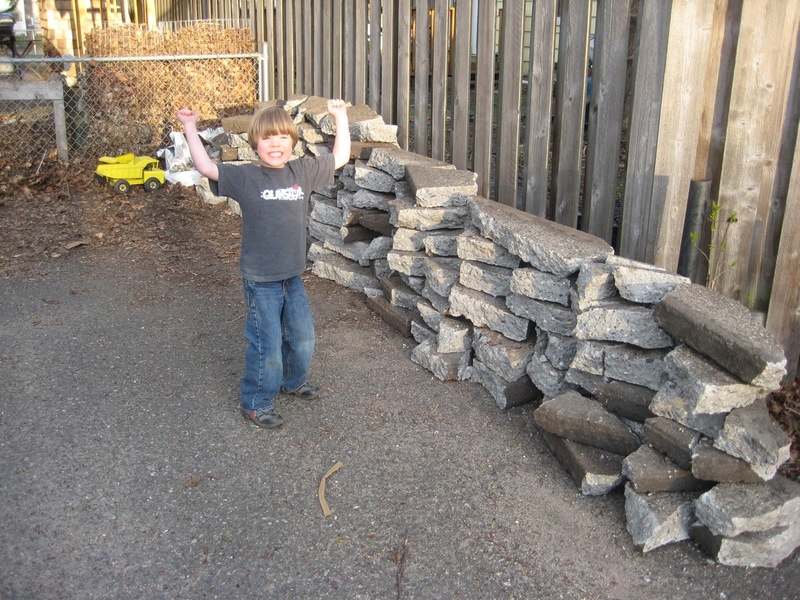 Then Adam busted out the 2nd half of the sidewalk, made an equally big pile, and that went too. All of this concrete will see a second life as part of numerous DIY projects — we had quite a few different people stop by and each took at least 5 or 6 pieces. Cool. The latest step in the project is filling in the trench with topsoil. 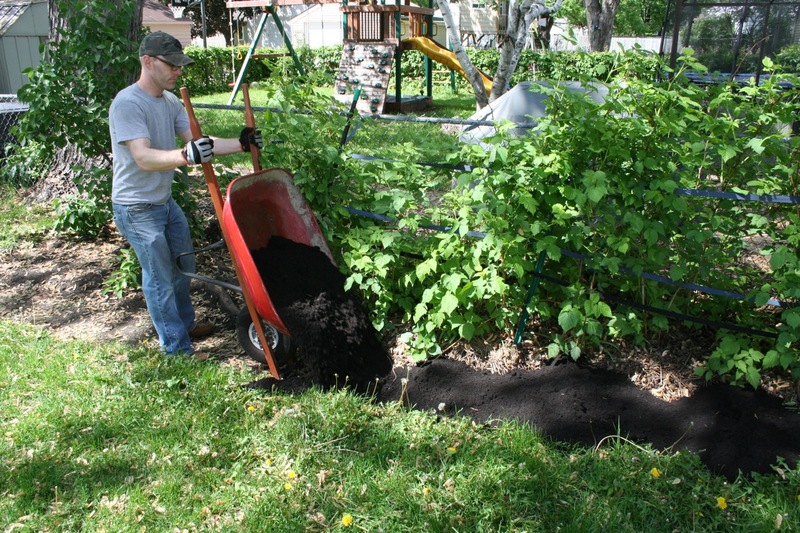 Then comes sheet mulching, then finally, planting. I’m afraid we are not going to be far enough along to buy all our plants at this weekend’s Friends Plant Sale, but… there are a fair number of nurseries near the Twin Cities that specialize in native plants so we still ought to be able to find everything we need. Hoping for Memorial Day weekend or so, at this point. Categories: Gardening, Permaculture, Practical, Water/energy efficiency | Tags: edible landscaping, landscaping, native plants, Permaculture | Permalink.